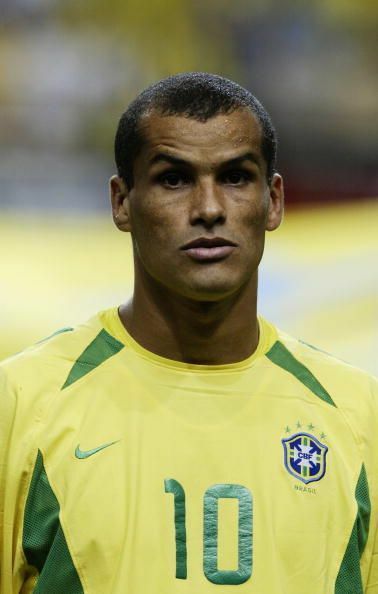 Rivaldo Vítor Borba Ferreira is a former professional footballer from Brazil. Considered to be as one of the greatest footballers of all time, Rivaldo was born on 19 April 1972 in Recife, Brazil. He was a powerful, highly skillful, and prolific goal-scorer known for his dribbling ability, use of feints, bending free kicks, penalty taking, and overhead kicks. He is primarily left-footed but was capable of playing on either thigh and could strike the ball with both feet. He played mainly as an attacking midfielder and sometimes as a second striker. In some occasions, he also played as a wide midfielder or as a winger. He is one of the greatest attacking midfielders and had won a number of tournaments for both his clubs and his country by scoring and creating goals as well. He is currently working as the president of Mogi Mirim Sports Club in Brazil. Rivaldo grew up in Brazil and played youth football for a few years in his country before making the move to Europe with Spanish club Deportivo La Coruna. Rivaldo began his professional career at the age of 16 when he signed with Paulistano FC in 1989. In 1993, he debuted for the Brazil national football team and scored a single goal in a friendly match against Mexico. He was a part of 1998 FIFA World Cup and helped Brazil reach the finals. In the 2002 FIFA World Cup, Rivaldo helped his country win their fifth world cup. Rivaldo, along with Ronaldo was named in the FIFA World Cup All-Star Team twice in 1998 and in 2002. From 1993 to 2003, Rivaldo played 74 matches for the national team and scored 35 goals. He is the seventh highest scorer for the Brazilian football team. He started his senior in 1991 when he joined Santa Cruz FC. He moved to Mogi Mirim in 1992 and then to Corinthians in 1993. In the next year, he switched local allegiances and moved to Palmeiras, again in 1996 he moved to Deportivo where he stayed for one season to play in La Liga. In 1997, he joined Barcelona in a transfer deal with Deportivo. He made 157 appearances for Barcelona and scored 86 goals in the five-year span, winning the 1998 and 1999 La Liga and the 1998 Copa del Rey. Rivaldo signed a three-year deal with Italian Serie A club Milan. With Milan, he won the Coppa Italia and the Champions League in the 2002–03 season. His other major stints came at Greek club Olympiacos (2004-07) and Uzbekistan’s club FC Bunyodkor (2008-10), with small runs with a few other clubs. Before he retired in 2015, Rivaldo was playing with Brazilian team Mogi Mirim. In 1997, Rivaldo was named as the La Liga Foreign Player of the Year and was the top scorer in Copa del Rey tournament. In 1999, he won the Ballon d'Or and was named FIFA World Player of the Year, FIFA World Player of the Year and the Most Valuable Player in Copa America. He was the top scorer at the tournament. In 2000, he won the UEFA Champions League Top Scorer award and IFFHS World's Top Goal Scorer of the Year and bronze award in FIFA World Player of the Year. In March 2014, Rivaldo announced his retirement from professional football career which spanned more than 20 years. However, he returned to play for Mogi Mirim in June 2015 in a match against Macae. Playing alongside his son Rivaldinho, the father-son duo scored goals for the team in July 2015 against Macae, helping the team to register a victory against the rivals. He later announced his retirement in August and is currently the President of the same club. Brazil 2002 World Cup winning squad: Where are they now?